Yes, President Obama carried with him not only the goodwill of the American people but the goodwill of the many people around the world. Unfortunately that goodwill was sacrificed on the altar of a foreign policy that was destined to create more insecurity in today’s world, for Obama has reneged on all the promises he made in that beautiful speech – rapprochement with Muslim nations; halt construction of Jewish settlements in Palestinian territories; be fully involved in a realistic road map to permanent peace, and a two state solution, etc. Guantanamo Bay is still in business. Today, there is hardly any difference between Obama and his predecessors in matters affecting the Muslim nations. This is not representing the good people of America! It is indeed ironic that as amiable as the Americans are, their government fails to show this in its dealings with the international community. This failure on the part of the government has made people to hate Americans (instead of the government), with extremists willing to pay the highest price to hamper America’s interests or cause the demise of innocent people. Through the use of missiles or bombs, America has been militarily involved with about 22 countries; if we add to this figure other countries visited by America’s bomb before the two World Wars, we would end up having the number risen to at least 40 countries. These include, but not restricted to: China 1945-46, 1950-53; Korea 1950-53; Guatemala 1954, 1960, 1967-69; Indonesia 1958; Cuba 1959-61; Congo 1964; Peru 1965; Laos 1964-73; Vietnam 1961-73; Cambodia 1969-70; Lebanon 1983-84; Grenada 1983; Libya 1986 and 2011, El Salvador 1980s; Nicaragua 1980s; Panama 1989; Iraq 1991 to present day; Somalia 1993; Bosnia (Republic of Srpska) 1995; Sudan 1998; Yugoslavia 1999; and Afghanistan 1998, 2001 to date. This is not counting the number of countries committing atrocities with weapons overtly or covertly given or sold to them by the US and its agents. It is a well-documented fact that Israel is the largest beneficiary of US military and financial aid even as the country uses the funds and equipment to further their criminal activities in Palestine. Israel has broken more international laws on warfare and genocide than any other but enjoys the highest patronage of the US Government. Incidentally, when the UN needs equipment to stop wars and genocides, the same US government is not so forthcoming. You only need to read the book, Shake Hands With The Devil, by Lt. Gen. Romeo Dallaire, UN Force Commander, United Nations Assistance Mission for Rwanda (UNAMIR) to get a vivid picture of the level of hypocrisy involved. I don’t want to think of Operation Desert Shield which quickly became Operation Desert Storm and how all these affected the Muslims. Or the consequences of Operation Restore Hope that has left Somalia ungovernable until this day. In all these operations, including the bombing of a pharmaceutical complex in Sudan, spearheaded by America, numberless innocent women and children were killed. Then came the big bang: what we now know as the War on Terror triggered by the so-called 9/11 “attacks” and the concoction of a false dossier of Iraq’s WMD, resulting in the invasion of Afghanistan and Iraq respectively. More loathsome is America’s double standards and incongruities in dealing with similar issues where its interest and principles collide. The United States government, not its people, is responsible for the enthronement of non-democratic elements in countries where democratic ones would not do its bidding; agents of this government have been fingered in the assassination of heads of state and powerful individuals in countries where the deaths of such people serve its interests. There is an underlying principle in all this; the US has no permanent friends, only permanent interests! The Afghan Mujahidin (Taliban Fighters) were once at the White House in 1985. 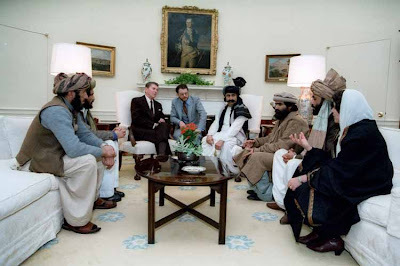 On the lawn of the building, then President Ronald Reagan introduced Mullah Umar (currently one of the most wanted men by the US) and others with the following words: “These gentlemen are the moral equivalents of the founding fathers of the United States...” How quickly that changed when they asked the US for proof of Osama bin Laden’s complicity in the 9/11 “attacks”! When the Taliban were fighting against the Soviets, America and many Arab nations assisted them with modern military arsenal; the America’s Central Intelligence Agency (CIA) helped with covert training in guerrilla warfare, tactics, and even supplied raw cash to help recruit new fighters. The idea was simple: the enemy of my enemy is my friend! Through America Osama bin Laden, and by extension, the Taliban and al-Qa’ida got all the skills they possess today, and are now amply paying back their benefactor who suddenly turned against them after using their Mujahidin to rout the Soviets. Fatten your dog to bite you, as the Arabs would say. Many countries around the world, following America’s footsteps, have used this war on terror mantra to imprison, subjugate, torture and kill devout Muslim activists who risked demanding for political freedom or raised dissenting voices to unjust rule. In the name of war on terror every atrocity was permissible; and America would look the other way. Any voice of Islam, an Imam, preacher, scholar and every leader of Islamic organisation is under surveillance by the secret service of his country acting on instructions from America. Make no mistake about it, your telephone/mobile lines are bugged; you have no secrets whatsoever in words or geography; they know who you speak with, and where you may be at any given time; you are a potential terrorist, and so a close eye must be fixed on you. Quite a lot of us do not even know that there are data banks and mainframe computers that glean information from our emails and which record our voices and scan all for keywords. There are analysts whose sole responsibility is to filter voice and data chatter for key phrases, words and names. Many have ended up in Guantanamo Bay without just cause. It is part of the new anti-terrorism act in the US to suspect, arrest/abduct and detain anyone for an indefinite length of time. They are even flown to cooperating countries where secret torture cells exist at which the ‘suspect’ undergoes what is referred to as ‘rendition’- another word for torturing a man until he ‘confesses’ to crimes. This shameful and inhumane practice came into light only during congressional hearings in the US. Due to the fact that torture is forbidden on US soil, they secretly take people to other lands for torturing. In an ironic twist, the US publicly calls these cooperating nations human rights abusers for arresting and detaining their citizens without charge or trial! Numberless countries have allowed America to use their airspaces and airports for the capture and onward transfer of suspected terrorists without due process or travel documents. These innocent Muslims would be undeservedly imprisoned in this infamous Bay only to come out with one ardent desire which they were not even thinking of before: kill as many Americans as they possibly can! They came into Guantanamo Bay sinless; they graduated as full time terrorists. Testimonies of former detainees abound, chronicling their ordeal while in detention, the torture both physical and psychological; the abuse both sexual and mental. The lives of these, mostly, young Muslims will never be the same again however much they try to forgive and forget. Their bodies and souls would for ever bear the scars of inhumanity, cruelty and injustice. The whole world is watching, and nobody is doing anything about it or even describing it with the appropriate adjectives because they are scared of the military and economic might of the US. Has the war on terror made either the world or America any safer? On the contrary it has produced more enemies to the United States, and made the entire universe, vast as it is, very unsecure indeed. What is the aim behind this war that has divided the whole world into only two classes: ‘you are either with us, or you are with the terrorists’? If, on the one hand, America has purposed, by this war on terror, the extermination of Islam or weakening of adherence to its tenets, then America has failed woefully. The awareness of Islam and the rate of conversion to it in non-Muslim lands increased manifold shortly after the onset of the so-called war on terrorism. And if, on the other hand, the war was orchestrated to water America’s insatiable thirst for oil, in this, also, America has failed, for thicker oil in the form of innocent blood has been running in the streets of Baghdad, Mosul, Kabul, Peshawar and many other Iraqi, Afghan and Pakistani cities. This same thirst for oil is reproducing similar war rhetoric from America towards Libya recently, like the one shamelessly aired during the run-up to the invasion of Iraq. That was not what we saw from America and her allies when the wave of demonstrations in the Arab region and North Africa started with Tunisia and later Egypt. Could it be that Zine al-Abidine Ben Ali and Muhammad Hosni Mubarak were acting the script in line with America’s agenda in the region better than Gaddafi’s defiant posture? Why was America’s leadership confused, lost vigour, and did not think of a military solution when people in Egypt rose against Mubarak’s rule? Is it not more civilised for the so called free world to leave the Libyan people to sort out things for themselves as did the Tunisians and Egyptians? Surely the US and NATO need not invade the country; especially as people doubt their motives, regardless of their reassurances. The people of Afghanistan and Iraq will not forget in a jiffy the reassurances of the US and its allies before invading them and turning their world upside down. Surely they could make Gaddafi stop the bombing of his people without bombing his country too. I am sure others may not see a parallel in the case of Libya and the others; they may even submit that the people of Egypt were not bombed. Yes, they were not bombed and the bombing in Libya should be stopped, but by who? If we go by the records, the US is in no position to head that effort. This side of the US Administration is its more prominent and ugly side. The other side is worthy of emulation. The US government I have seen is efficient and less opaque than my own government. The process of selecting its leaders and public office holders is less dishonest too. The people have a better say in the affairs of the land and how it affects them. Its domestic policies are for the most part good and commendable. It is its foreign policies that stink to high heavens. I have seen the difference between the hardworking, warm, good-natured and tolerant majority of Americans and the hegemonic, war-mongering and ruthless hypocrisy of the American government through its foreign policies. I have also seen the efficient and just way their country is managed. I have seen the people of the United States of America and they look so different from the government of the United States of America. American government all along have been propagandists quite different from what their citizens are. The average American does not know what is happening outside America because their Government have always kept them out of touch. It is Islam that has attempted to expose them, so they will never like Muslims. However, with the rate that Americans are converting into Islam, some day the truth will come out. I just wish that we can sustain the patience. Thank you Ustaz for the information. My brother, may Almighty Allah bless you for this information.